Mythic Delirium Books, 9781732644014, 220pp. "Achingly familiar and wonderfully strange." 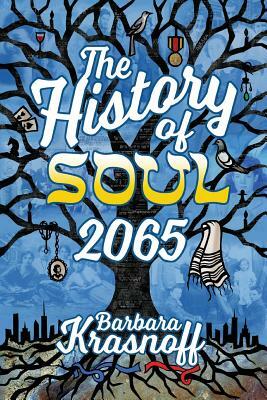 "Plunge into The History of Soul 2065, there's nothing like it." Months before World War I breaks out, two young Jewish girls just on the edge of adolescence--one from a bustling Russian city, the other from a German estate--meet in an eerie, magical forest glade. They are immediately drawn to one another and swear an oath to meet again. Though war and an ocean will separate the two for the rest of their lives, the promise that they made to each other continues through the intertwined lives of their descendants. This epic tale of the supernatural follows their families from the turn of the 20th Century through the terrors of the Holocaust and ultimately to the wonders of a future they never could have imagined. The History of Soul 2065 encompasses accounts of sorcery, ghosts, time travel, virtual reality, alien contact, and elemental confrontations between good and evil. Understated and epic, cathartic and bittersweet, the twenty connected stories in Nebula Award finalist Barbara Krasnoff's debut form a mosaic narrative even greater than its finely crafted parts. Jane Yolen, Science Fiction and Fantasy Writers of America Grand Master, says in her introduction: "If you, like me, love quirky and original fantasy stories, I advise you to dive right in. If you, like me, admire tough writing that's not afraid of the grit, dive right in. If you, like me, want to hang out a while with characters rich in their own traditions, dive right in. This is storytelling at the top of the heap."